Colder PLC Series Couplings are injection molded from acetal thermoplastic. This makes them resistant to most mild chemicals and durable enough to give many years of trouble free service. 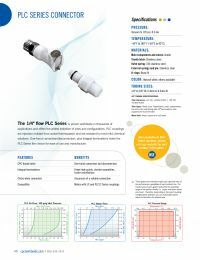 The PLC Series offers the largest selection of sizes and configurations and has been proven worldwide in thousands of applications.